While flipping through the Summer 2019 issue of knitscene, my wife, Mimi, showed me the Flash Point Top and said “You should knit this—it would look so so cute on you!” Isn’t that sweet? We’re both knitters (we met in a knit shop! ), and we’ve been talking about casting on summer tops, or in her case, finishing the summer top she cast on last spring. I took a closer look at the Flash Point Top, and there’s a lot to love about it. The high-contrast diagonal stripes are what grabbed Mimi, and me, too. And I love red! It’s such a great summer color, adding bit of a spoiler to all those pastels and jewel tones that define the season. The top is knit with two yarns: the red is Cascade Yarns Ultra Pima Fine and the cream is Louet North America Euroflax Sport. Flax and cotton—perfection for summer wear. A bonus for me is that Lana Jois designed this top to be knit in two pieces and joined. What?!? 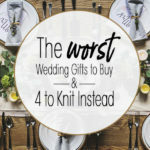 Not knit in the round? While I do enjoy a seamless project, in warmer weather a pieced garment is less weight (and heat) in your lap. Flash Point features diagonal stripes knit on the bias, which can distort fabric a bit, so the side seams will alleviate this. Smart. 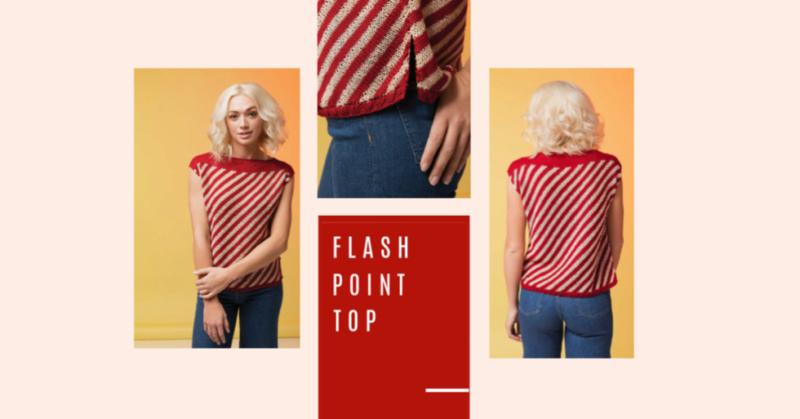 The Flash Point Top’s alternating red and white stripes represent the flash point, the temperature at which an organic compound gives off sufficient vapor to spontaneously combust. And this top is just that, HOT! Finished Size 34½ (37½, 42, 45, 48, 53)” circumference at underarm. Top shown measures 37½ “; modeled with 4” of positive ease. Yarn Cascade Yarns Ultra Pima Fine (100% Pima cotton; 137 yd [125 m]/1¾ oz [50 g]): #3713 wine (red; MC), 3 (4, 4, 5, 5, 5) skeins. Louet North America Euroflax Sport (100% wet-spun linen; 270 yd [247 m]/3½ oz [100 g]): champagne (cream; CC), 2 skeins. Notions Size 6 (4 mm). Adjust needle size if necessary to obtain the correct gauge. Gauge 22 sts and 29 rnds = 4″ in St st stripe patt. Check out the other designs in knitscene Summer 2019, all inspired by the raw power of fire.